Hey guys what ever happened to 1gb plans for UFb to all of New Zealand not just gig town. Those are the 900/400 are the exact same as gigatown. Yeah, it has always been 1Gb down 500Mb up no matter where you are. 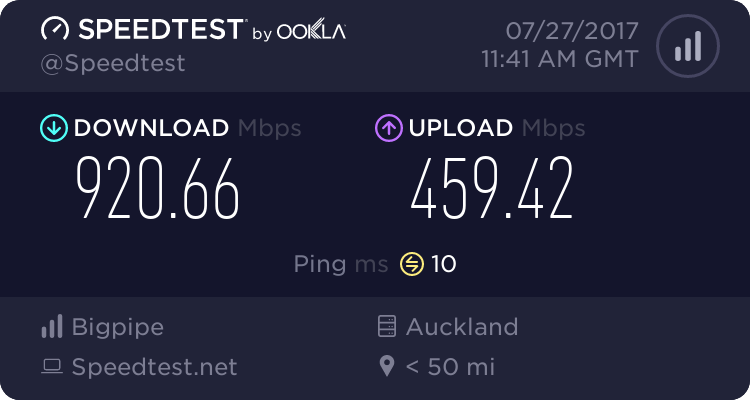 The only difference is that it's the same price as 100Mb in Dunedin. The speeds have not been reduced, those are just conservative numbers. You're not going to get exactly 1000Mbps down because of overhead probably closer to 900 - 950Mbps, whereas for upload you can actully get a bit above 500Mbps. Because that's what is legally required of us. Some ISPs market it as 1000/500, but it's the exact same product. off the top of my head, chorus provision 1000/550. obviously once overhead comes into it, gbit is not possible. Give the following article a read, it may explain it better. Realistically, if your expecting to see 1Gbps on a raw download, you are going to hit a constraint over TCP/IP more than likely before the maximum speed of the connection is reached. The main reason the big ISPs don't advertise it as 1000/500 is because they might get in trouble with the law regarding Fair Trading Act. better to under describe the service and over perform than over describe it and under deliver. you cant get 1000mbit down, so why advertise it as such. and anyway its all the same thing so im not sure why you are worried. Because LITERALLY NO ONE will notice the difference between a "1Gbps" and "900Mbps" service and it's all just plain stupid and should never have been done in the first place. You would also need router and ONT with 10Gb ports to achieve actual throughput of 1Gbps. If you need more, there are point to point fibre you can pay for. We have optical switching at our organisation and can send well over 1Tbps over a single pair of fibre. I'm going to complain as I am not getting the speeds I signed up for. I want my extra 80Mbit down and 40Mbit up. They should give me compensation because of the trouble they've caused me. WORST ISP EVER. Jokes aside that is the exact reason why ISP's stopped advertising Gigabit speeds - I've seen that exact kind of comment. I've also seen comments from people a few years back who were blaming their ISP because they couldn't even get 200/200 on their 15 year old Windows XP machine (really not kidding). Giving a low number (800/400Mbit) and having customers either reach that or exceed that is better than saying "1000/500" and having people think something is wrong with their internet. You will not notice any difference on day to day use. Steam downloads can't even get that high in speed. Origin used to come close but I've also noticed that is tapering off since more people are on Gigabit now. For most people 100/20Mbit is totally fine.